How Much Does Free Installation Cost? How much does FREE Flooring Installation cost? Installation is not cheap and cheap installation is worth nothing at all. Free installation? Well, there’s no such thing. It simply means that the cost has already been included in the price you pay. Don’t fall for it. 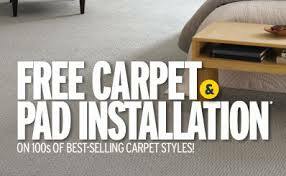 Nevertheless, several leading home centers have taken the approach of offering free or greatly reduced prices for installation, and other flooring retailers have followed suit. The real problem is that these offers provide only the most basic of installation services and, in many cases, you could end up paying more. Prices vary widely depending on product and region as well as the complexity of the install. Other factors that could end up costing you more: stairways; doors that need to be recut; a subfloor that is in need of repair; additional furniture moving; and, moving large appliances. Most specialty flooring retailers are honest with you about installation costs because that is what distinguishes them from home centers – professional installation. They're also more likely to provide a professional measure of your space where you can help them identify the problem areas that might require additional labor. Most stores will offer free measures, at least with a purchase; it gives them - and you - an opportunity to identify any other work, such as subfloor prep, that may need to be done. Otherwise, expect to pay around $25 to $50 for someone to come out to measure your home. "Free" Installation is not free. 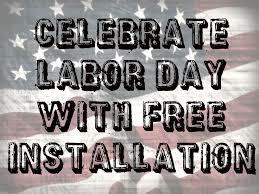 Free labor on Labor Day. Ironic.